Since its introduction in the early 1990s in Brussels, open-street CCTV has grown both in scope and in its purpose. The camera network of the Belgian capital city has undergone successive waves of extension, gradually gaining ground both physically and ideologically. In this article, we propose to investigate the geographical extension and distribution of open-street cameras in Brussels, as well as the underlying policies and rationale. We have produced a detailed map of the spatial distribution of open-street cameras at the scale of the city region. In addition to a spatial analysis, a series of semi-structured interviews were conducted with public authorities and local police. The CCTV network in Brussels is entangled in a context of global city competition and the neoliberal governance of insecurity, which prompted us to consider the uptake of video surveillance in light of the local political economy. Depuis son introduction au début des années 1990 à Bruxelles, la vidéosurveillance dans l’espace public a pris de l’ampleur et ses objectifs se sont élargis. Le réseau de caméras de la capitale belge s’est étendu par vagues successives, gagnant du terrain sur le plan à la fois physique et idéologique. Le présent article vise à étudier le déploiement et la répartition géographiques des caméras dans les lieux publics à Bruxelles, ainsi que les politiques et les logiques sous-jacentes. Nous avons dressé une carte exhaustive montrant la répartition spatiale des caméras de voie publique installées dans toute la région. Une série d’entretiens semi-directifs avec des représentants des autorités publiques et de la police locale est venue compléter cette analyse spatiale. Il en est ressorti que le réseau bruxellois de caméras de surveillance s’inscrit dans un contexte de concurrence mondiale entre les villes et de gouvernance néolibérale à l’égard de l’insécurité, ce qui nous a par ailleurs amenés à nous interroger sur le recours effectif à la vidéosurveillance à la lumière de son économie politique locale. Sinds de introductie van CCTV (closed circuit television) in de vroege jaren negentig in de Brusselse publieke ruimte groeide dit cameratoezichtsysteem qua reikwijdte en doeleinden. Het cameranetwerk van de Belgische hoofdstad kent opeenvolgende uitbreidingsgolven en wint geleidelijk terrein, zowel fysiek als ideologisch. In dit artikel onderzoeken we de geografische uitbreiding en de verdeling van camera’s in de Brusselse publieke ruimte, evenals het beleid en de beweegredenen die daaraan ten grondslag liggen. We hebben een exhaustieve kaart gemaakt van de ruimtelijke verdeling van de beveiligingscamera’s op schaal van de stadsregio’s. Deze ruimtelijke analyse werd aangevuld met een reeks van semigestructureerde interviews met publieke autoriteiten en lokale politie. We beschrijven het Brusselse CCTV-netwerk enerzijds in een context van wereldwijd verweven stedelijke concurrentie en neoliberaal beleid ten opzichte van onveiligheid, maar anderzijds bekijken we de daadwerkelijke ontwikkeling van videosurveillance in het licht van zijn lokale politieke economie. 2.2. On a larger scale: what is found around open-street cameras? This paper builds on our master’s thesis entitled “Towards the Panoptic City: the proliferation of video surveillance in Brussels and Copenhagen”, under the supervision of Mathieu Van Criekingen (ULB) for the 4Cities UNICA Euromaster in Urban Studies. The defence took place in September 2014 in Brussels. 1Closed circuit television (CCTV) is defined as “a TV system in which signals are not publicly distributed but are monitored, primarily for surveillance and security purposes” [Pedersen, 2011]. Today it represents a huge financial market worldwide – nearly $15 billion in 2013, with an expected annual growth rate of 18 % [Sudip 2015] – and has become a widespread urban feature in European cities. 2Open-street CCTV refers to the cameras used to monitor public space by public authorities or the police. Over the last two decades, its introduction has been widely examined from various perspectives, in the fields of sociology, philosophy and surveillance studies, among others. However, geographical studies are not numerous and are often limited in scope or were carried out at a time when open-street CCTV was confined to city centres [e.g. Galdon Clavell, 2013]. Nonetheless, in our view, a spatial approach provides a better understanding of this technology. The geography of CCTV highlights its uneven distribution throughout the territory, and shows that it is aimed at protecting specific interests and at monitoring specific social groups. 3In order to establish the CCTV profile of Brussels, we first adopted an empirical approach. 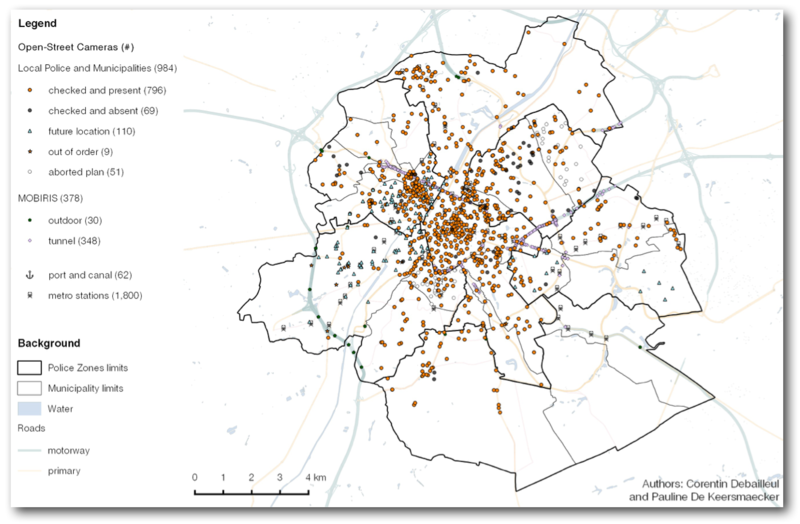 We mapped the spatial distribution of public open-street cameras in the Brussels-Capital Region. Secondly, we reviewed reports by police and city officials in local newspapers and conducted semi-structured interviews. We met 16 interviewees ranging from police and security agents who monitor the cameras, to police chiefs and local and regional authorities. Our goal was to clarify the process and reasons behind the location of the cameras.1 Finally, we checked the reliability of our data through fieldwork (each camera location was verified on site). The research was carried out in 2014 and the data were updated in January 2016. 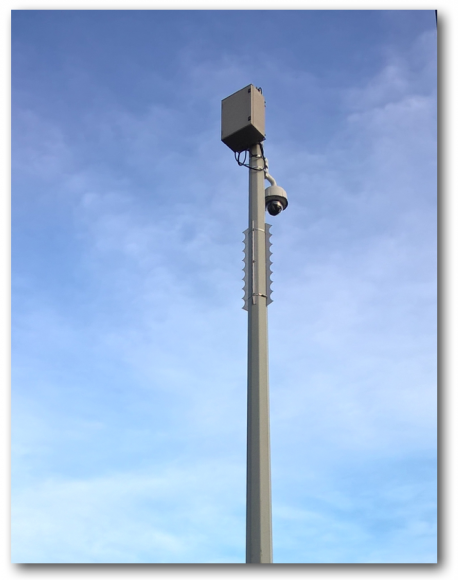 Public cameras are usually 360° domes placed at a height of about 6 metres on façades, street lamps or poles. 4In this paper, we begin by delineating the historical uptake of public cameras in Brussels. We then present our empirical results and continue with their analysis in light of the Region’s social, legal, fiscal and political context. The concluding section wraps up our results and analysis. 5In 1968, the public transport company STIB/MIVB installed its first surveillance cameras to monitor metro platforms and sales booths. Cameras appeared only sporadically in the public space during the 1990s. The European Football Championships (UEFA) in 2000 provided an opportunity for cameras to appear in the surroundings of the Heysel stadium. Simultaneously, cameras were placed on the small ring road which surrounds the pentagon, for traffic regulation purposes. The technology truly pervaded the city in 2003 when the regional government earmarked a budget of € 1.5 million to help municipalities develop open-street schemes in their own territories. All municipalities, with the exception of Auderghem and Watermael-Boitsfort, replied favourably and applied for the grant [Lamquin and Voogt, 2003]. 6The first CCTV schemes were thus initiated by municipalities, but the control of public cameras was shifted gradually to the police areas. At the end of the 2000s, the CCTV networks became unified and new control rooms were set up in the main police stations (except for Koekelberg, which retained its municipal system). The most recent development plans were more coordinated, such as the four-phase plan to install 230 cameras in the Bruxelles Capitale Ixelles police area (Polbru) between 2005 and 2015 (for a budget of over €10 million), the ongoing plan for 130 cameras in the Brussels-North police area (€6 million) and, finally, the 108 cameras planned by the Brussels-South police area, which was delayed due to a case of embezzlement, but should be completed in 2016 [Dupont, 2012]. 8Besides these police and municipal initiatives, STIB/MIVB is now completing the refurbishment of its metro stations, which includes the setting up of an extensive video surveillance network, fully funded by the Brussels-Capital Region. Its aim is to have electronic eyes covering up to 95 % of the area it manages. The transport company is already the largest CCTV owner in the region, with 1,800 units in buildings (and 4,000 in vehicles), though this number is expected to double when the fully automated metro is implemented [La Capitale, 2014]. 9The monitoring of public video surveillance in Brussels is currently very scattered, to the discontent of regional authorities who would prefer a centralised network.3 Steps have therefore been taken in recent years to integrate the existing public camera schemes in the capital city. 10In 2013, the Brussels Regional Informatics Centre (BRIC) was appointed to study the implementation of a “comprehensive, integrated solution for video surveillance to equip Brussels with a regional network.” It will connect the networks of the different police areas with those of the Port of Brussels, the fire department, the public transport companies (STIB/MIVB and SNCB/NMBS) and the Brussels Ministry for Mobility, also known as MOBIRIS [Carlot, 2013]. 12According to our interviews with the authorities in charge of CCTV (be it from the local police areas or from the public transport company), it emerged that there was limited enthusiasm regarding this politically driven plan. They feared that they would lose control of “their” cameras, stating that they wished to “keep their hand on the joystick”. 13By law, people are required to inform the Privacy Commission when setting up CCTV systems [Moniteur belge, 2007]. The Commission then adds a new entry in its online public registry. As we were aware that the registry was far from exhaustive, we decided to focus on public cameras, based on the assumption that public authorities would have fulfilled their duty by making the data easily accessible to us. The reality proved otherwise, however, as we eventually found twice as many cameras as there were in the registry. 14In the end, we had to use 22 different sources. Data were acquired mostly from the police, either through direct contact or from yearly reports (334 cameras); from the Privacy Commission registry (321); from newspaper articles (139); from the websites of municipalities or communications with civil servants (69); from previous studies (69); and finally from our own fieldwork (59) [Dessouroux et al., 2009; La DH, 2002; Jette, 2014; Nimy, 2014; Privacy Commission, n.d.; Romainville, 2005; Marlow Police Zone, 2013; Vlan, 2009 and personal communications]. 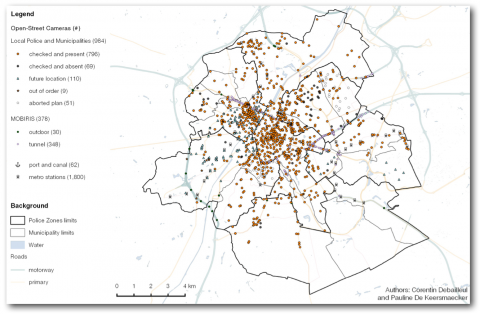 15In total, we mapped 1,365 public open-street cameras in the Brussels-Capital Region. 378 cameras are monitored by MOBIRIS (symbolised by pink diamonds for the 348 in the tunnels and by green pentagons for the 30 outside). 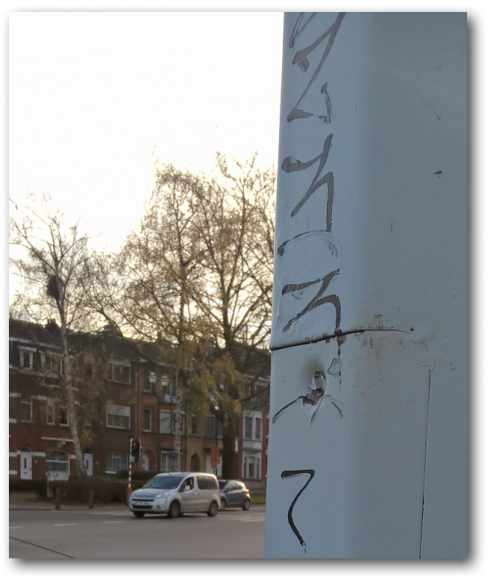 984 cameras are monitored by the local police (or by municipal stewards in the case of Koekelberg). All of them were verified in the field or using Google Street View. 796 cameras were present (orange dots on the map), while 69 were not found for unknown reasons (black dots). 16The blue triangles represent the cameras already scheduled to be set up in the near future. The map also indicates a few cameras in Anderlecht which are permanently out of order (orange stars). The map used to indicate many more, but most of them will soon be replaced and are therefore represented by blue triangles. 17The municipalities of Saint-Gilles and Evere had considered installing cameras to fight against illegal waste dumping (white dots), however, the plans were abandoned. The 61 cameras owned by the Port of Brussels which are located along the canal were not represented, as we did not manage to obtain accurate data. We added the metro stations to our map as the STIB/MIVB has placed 1,800 cameras, but we do not know their exact distribution. 18The map shows that the neighbourhoods with the highest number of surveillance cameras are the city centre and the working-class and migrant neighbourhoods (e.g. Matongé and Molenbeek’s historic centre). Many public cameras can also be found in the area of the European institutions, in the traditional working-class neighbourhood of the centre, or in the northern part of the city (Schaerbeek). The camera density tends to decrease as we move away from the centre, with the exception of some local commercial hubs and town halls. 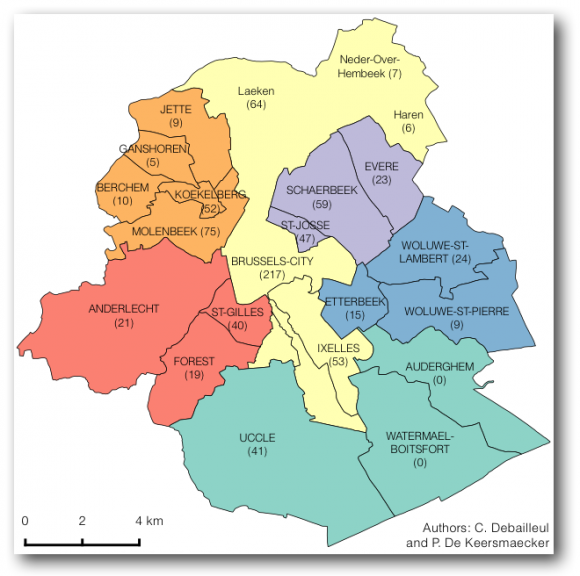 A large share of Brussels is not subject to public video surveillance, notably the entire municipalities of Auderghem and Watermael-Boitsfort. With Woluwe and Uccle (which have rather low densities of cameras), they are part of the south-eastern quadrant of the city, characterised by its relative wealth. 19For 867 cameras (88 % of all listed open-street police cameras), we checked the elements surrounding them through quick fieldwork and using Google Maps, Open-Street Map or Google Street View. It is therefore quite a rough overview and is far from being an in-depth ethnographic study of places under surveillance. The chart below represents the features present in the surroundings of the cameras studied in over 4 % of cases. 20Many cameras were placed in secondary centres in the city, such as Town Hall squares, church forecourts, local retail nodes, or large intersections. Main roads and metro, tram and bus stops are sites of arrival in – and departure from – a particular space or municipality. Like train stations, they are places of high mobility and are very likely to be monitored. In the same way, places of very low mobility such as squares, bars, parks and parking lots are also often watched. Finally, there are places which require protection due to their intrinsic interest, such as monuments and tourist attractions (the Atomium, Manneken Pis and Grand’Place), national interest (Ministries, Royal Palace and national symbols), and municipal interest (Town Hall, libraries, schools and social housing). In the last case, local councils seem to behave like private owners protecting their belongings. “Video surveillance simply modernises Newman’s defensible space principles” [Leclercq 2009: 144-145, our translation]. 21We consider CCTV as part of defensive urbanism, a concept which allows us to understand its presence. The objective is to place video surveillance in a wider socio-economic context and to link it theoretically to other means of surveillance and social control, as well as to the urban environment in which it is embedded. This allows an understanding of the context, purpose and effects of video surveillance. 22The goal of defensive urbanism is to implement environmental design policies which make the city more secure both by deterring criminal behaviour and by enhancing the sense of ownership and responsibility of inhabitants with respect to their living environment. Its founding publication is the book Defensible Space. People and Design in the Violent City, by architect and city planner Oscar Newman . This theory is based on the questionable assertion that social problems can be solved by technical urban design and architectural measures. 24In this perspective, CCTV may be considered as a means of surveillance used to implement one of the goals of defensive urbanism, i.e. reducing crime through the shaping of public spaces. Indeed, CCTV clearly contributes to reducing the number of hidden spaces (one of the ways in which defensive urbanism operates), which in our view, illustrates an obsessive need for the authorities to minimise risks and maximise control. 25The increase in technical means of surveillance should not lead us to overlook traditional forms of control, among which human activity still has a central role. In addition to traditional police officers, private security agents are increasing in number and have recently received new attributions [Belga, 2012], municipal stewards are likely to have their power extended and join the traditional police force [Sadani, 2014], and civil volunteers may be hired more regularly to help with police action [Le Soir, 2014b]. The army started roaming the streets after the November 2015 Paris attacks. At the same time, municipalities have been employing experts to confront the “radicalisation process” and school teachers are asked to investigate and report early warning signs [Simonet, 2013]. The grey area which blurs the distinction between social and repressive actions is therefore expanding as a sign of the “integrated logic” of the social-securitarian state [Réa, 2007]. 26Sensational events are always used as an argument in favour of the implementation or extension of CCTV networks [see e.g. Coleman and Sim, 2000; Hier, Walby and Greenberg, 2006; Carr, 2016]. In the case of Brussels, the murder of Joe Van Holsbeek at the Central Station in April 2006 is emblematic of the use of sensational events to justify open-street CCTV [TV Brussel, 2008; brusselsnieuws, 2009; De Wolf and Mahieu, 2014]. The use of such events causes the debate to become irrational. When those who oppose video surveillance are accused of being on the side of the murderers, critical thought is made impossible. Moreover, it is fundamental to investigate the reasons behind the success of video surveillance, as the usual legitimisation for its implementation is groundless for the most part. Indeed, the argument of the struggle against crime is unwarranted, as studies show that it has a limited effect on nuisance and that there is a spatial shift of offences rather than a reduction in crime [IAU, 2008; Mortelé and Deprins, 2012]. 27In their analysis of the worldwide distribution of CCTV in public spaces, Norris, McCahill and Wood  identified the socio-economic, legal, fiscal and political contexts as the four decisive factors in determining the stage of development of a local CCTV scheme. We decided to adopt this multivariate approach as we deemed it particularly appropriate in order to grasp the complexity of the uptake of video surveillance in Brussels. 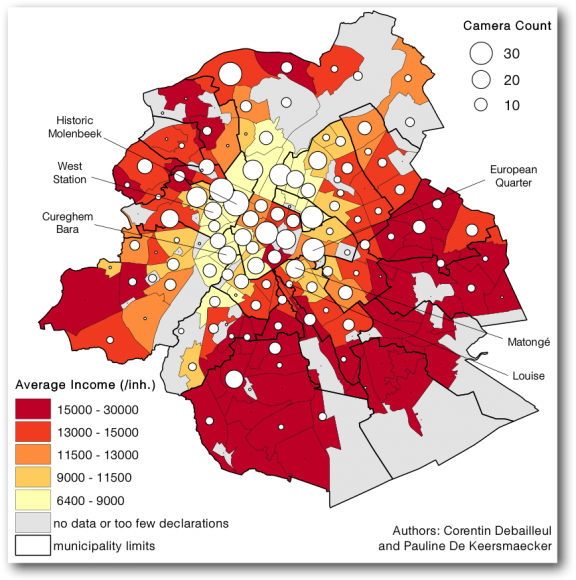 28Brussels can be described as concomitantly very rich and very poor – in short, unequal. As the third region in the European Union in terms of GDP [Eurostat, 2012], the youth unemployment rate in some of its neighbourhoods is nevertheless over 50 % [IBSA, 2015]. Norris, McCahill and Wood [2004: 121] point to the use of CCTV as a “package to revitalise the city centres by mimicking the security measures found in the malls and could be used to monitor and regulate an increasingly visible underclass”. The most deprived districts are concentrated within walking distance of the commercial and tourist centre, making social unrest latent at the city gates. 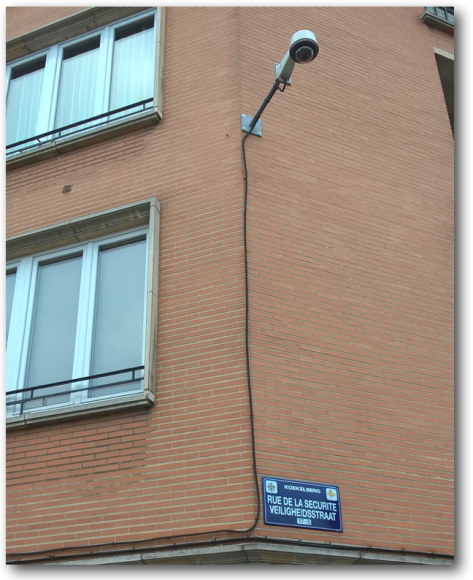 29When cameras were installed in the Bruxelles Capitale Ixelles police area, Matongé was among the first and most monitored locations. This historically Congolese neighbourhood is home to a relatively poor population and faces issues involving drug trafficking, but it is also located next to Avenue Louise and its luxury shops, the shops in Chaussée d’Ixelles, and the European Institutions. Similarly, the poorest neighbourhoods (Cureghem, Molenbeek, West Station) are located just next to the city centre and its commercial and tourist activity. The reason for fearing such situations is based on the fact that when inequalities are strong, visible and stand alongside each other, social problems including crime have proven to be higher [Brennan 2012: 7-8]. According to this logic, poverty itself is considered less of a problem than wealth disparities, especially if spatially close. average income per inhabitant (r=-0.494, p=1.2x10-8). 31In some countries, laws or constitutions have acted as a barrier against the proliferation of CCTV, at least temporarily. This is not the case in Belgium, where the legal framework is rather permissive and has simply evolved with technological innovations and police practices. 32In Belgium, the Privacy Act adopted in 1992 oversees the protection of privacy in relation to the processing of personal data. The Privacy Commission was established together with this act to ensure the fair and protected use of personal data. The 2007 Camera Act regulates the installation and use of surveillance cameras. It distinguishes between open spaces, publicly accessible closed spaces, and closed spaces which are not accessible by the public. A camera can only be placed in an open space with the agreement of the municipal council, which first has to consult with the local police chief [Moniteur Belge, 2007: Art. 5]. There are restrictions on the purposes legally fulfilled by cameras in publicly accessible closed spaces, but their installation does not otherwise require any particular authorisation [Art. 6]. While cameras in closed spaces can be installed freely [Art. 7], all CCTV cameras, regardless of the type of space, require a declaration made to the local police chief and the Privacy Commission [Art. 5, 6 and 7]. 33It is forbidden for private persons to specifically film areas which they are not responsible for, except with the agreement of those in charge [Art. 5, §3]. In theory, this denies people the right to monitor public space, but the vagueness of the term “specifically” [Atas and Deroover, 2009: 90] as well as experience in the field show that the opposite is true. This situation implies that an exhaustive study of video surveillance in public space should not limit itself to the analysis of public cameras, and highlights the main restriction of this article. 34The aim of the Camera Act was to simplify the use of CCTV and, as such, it was a success. Its most problematic aspect was modified the very year of its creation: the obligation to produce a “security and efficiency study” before any CCTV implementation in the public space was simply removed [Dumortier, 2009: 19]. However, the obligation to show some restraint and comply with the principles of proportionality, appropriateness and minimum intervention, which are supposed to preside in the choice of installing a camera, is simply neglected. Similarly, it is mandatory to declare and specify the aim(s) of a surveillance system to the authorities. However, stating that a camera will be used for “security matters” or for “surveillance purposes” is enough. These types of justification are so broad and vague that they actually allow an almost unlimited use. 35While laws are expected to determine the framework of police action, the opposite is often true: first the police act, and then laws are adjusted to legitimise practices [Neocleous, 2000]. For example, recent on-board camera and “bodycam” systems in use in Brussels-North simply do not comply with signage laws. Instead of respecting the law and abstaining from using these tools – as their lack of legal compliance should imply – the police use them anyway, as they assume that the law will soon be adapted to suit their practices. 37In addition to the aforementioned regional grants, the European Union also subsidises the municipalities of Brussels where the European Institutions are located and European summits are held. The Eurotop Fund amounts to € 20 million per year, divided between the different municipalities and police areas [AVCB, 2012: 7], although of course not exclusively for CCTV implementation. 39It is important to note that open-street CCTV is a costly technological tool and is mainly used for police activities, which means that these funds raise police budgets indirectly8 and constitute money transfers from the state to private corporations [Carr, 2016]. 40When municipalities plan to implement a CCTV scheme, the Ministry of the Interior first advises them to define a goal for their system [Mortelé and Deprins, 2012: 37]. This exemplifies the typical absence – or at least vagueness – of reasons prompting politicians to have cameras installed. We agree with the authors who claim that cameras are first and foremost a political tool used by decision makers in an attempt to do something about insecurity issues, even if it is purely cosmetic [Norris, 2009; Carr, 2016]. Influenced by the media and the pressing demands of local shopkeepers, there is an overpowering need for policy makers to take action against insecurity [Bétin, Martinais and Renard, 2003]. At the same time, public officials tend to be stuck in the short-sightedness inherent to the regular deadlines of the election process. They have to look for simple, vote-catching solutions to include in their platform, which may be fulfilled effectively if they are elected. Our study shows that the political will is the driving force behind the implementation and expansion of open-street CCTV, while the police are often less convinced about it (as they are more aware of the technological limits). Nonetheless, the police welcome the projects when they do not have to fund them. 42However, as we have seen, there is a current trend towards centralisation, and these local skirmishes are likely to lose significance in the coming years and eventually vanish. Let us not be mistaken: this does not mean the end of competition, but a change in scale. We live in a context where globalised competition between cities is a reality, and where public authorities tend to import techniques and policies from abroad, sometimes even without any pressure to do so. “A degree of international policy convergence has occurred” [Galdon Clavell 2013: 201]. 43These “policy transfer” dynamics are particularly visible in Brussels, where the proliferation of CCTV and the future integrated network are inspired explicitly by the case of Paris. Right-wing MP and mayor of Etterbeek Vincent De Wolf – one of the biggest supporters of the project – took part in a parliamentary delegation in Paris with other officials and police chiefs. The object was to visit the city’s installations and use them as an inspiration. When we interviewed Mr. De Wolf, he expressed this logic of competition very clearly by stating that Brussels used to be ahead of Paris in terms of CCTV but that the trend has been reversed: the opposite situation prevails now, hence the “necessity” to take action. 45An analysis of the public video surveillance scheme in Brussels was carried out with the use of self-produced maps and semi-structured interviews. First, it appears that a series of contextual elements have created a favourable environment for CCTV development in Brussels. 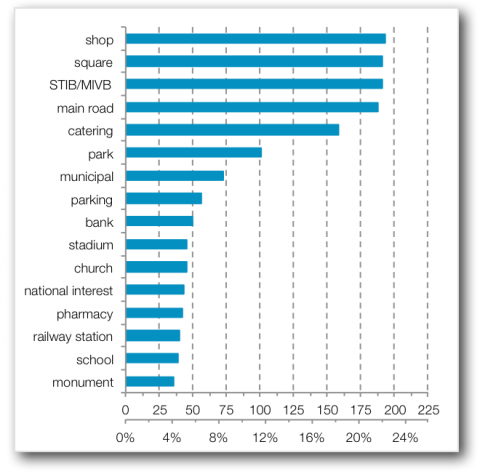 Second, the cameras are mainly concentrated in the consumption hubs as well as in the most socio-economically deprived areas, especially if these areas have a large “non-western” population and are located within walking distance from the city centre. 46Moreover, there seems to be an increased surveillance of these two types of space when they coexist. This can be explained by the fact that, in a context of a capitalist globalised economy and increased competition between cities, part of a city’s strategy to attract international capital is to make its environment “safer” [Galdon Clavell 2013]. 47In conclusion, CCTV may be conceptualised at the crossroads of private economic interests, local political stakes, and faith in technological fixes. As Stephen Graham puts it, policies are shaped by “technophilic dreams and fetishistic urges for mastery and control. [...] Superior technology is thus the key to all locks, the silver bullet” [Graham, 2010: 162]. Nonetheless, the actual uptake of CCTV exists in different forms and intensities according to the city, and must be analysed in light of the local political economy [Galdon Clavell 2013]. ATAS, Caroline and DEROOVER, Marijke, 2009. La pratique de la vidéosurveillance en Belgique : application et évaluation de la loi du 21 mars 2007. In DEVRESSE, Marie-Sophie and PIERET, Julien (dir.) La vidéosurveillance. Entre usages politiques et pratiques policières. Brussels: Politeia, pp. 69-100. AVCB, 2012. Le financement des zones de police bruxelloises. Brussels. Association des villes et communes de la Région de Bruxelles-Capitale. BÉTIN, Christophe, MARTINAIS, Emmanuel and RENARD, Marie-Christine, 2003. Sécurité, Vidéosurveillance et construction de la déviance : l’exemple du centre-ville de Lyon. In: Déviance et Société, vol. 27, No. 1, pp. 3-24. BRENNAN, Jordan, 2012. A Shrinking Universe: How concentrated corporate power is shaping income inequality in Canada. Ottawa. Canadian Centre for Policy Alternatives. CARR, Robert, 2016. Political Economy and the Australian Government’s CCTV Programme: An Exploration of State-Sponsored Street Cameras and the Cultivation of Consent and Business in Local Communities. In: Surveillance & Society, vol. 14, No. 1, pp. 90-112. COLEMAN, Roy and SIM, Joe, 2000. You’ll Never Walk Alone: CCTV surveillance, order and neo-liberal rule in Liverpool city centre. In: British Journal of Sociology, vol. 51, No. 4, pp. 623–639. DESSOUROUX, Christian, VAN CRIEKINGEN, Mathieu and DECROLY, Jean-Michel, 2009. Embellissement sous surveillance : une géographie des politiques de réaménagement des espaces publics au centre de Bruxelles. In: Belgeo. 2009. No. 2, pp. 167-184. DUMORTIER, Franck, 2009. État de l’art, volet juridique. In LOBET-MARIS Claire, DUMORTIER Frank and VAN ESPEN Alexis, 2010. Urban Eyes. Recherche en vue d’une politique raisonnée et appropriée en matière de surveillance urbaine. Namur: FUNDP. NORRIS, Clive, MCCAHILL, Mike and WOOD, David, 2004. The Growth of CCTV: a global perspective on the international diffusion of video surveillance in publicly accessible space. In: Surveillance and Society: CCTV Special, vol. 2, No. 2/3, pp. 110-135. GALDON CLAVELL, Gemma, 2013. CCTV in Barcelona: The political economy of surveillance in the (wannabe) global city. In BALL Kirstie and SNIDER Laureen (ed. ), The Surveillance-Industrial Complex: A political economy of surveillance. London and New York: Routledge. pp. 191-207. GRAHAM, Stephen, 2010. Cities Under Siege: The New Military Urbanism. London: Verso. HIER, Sean, WALBY, Kevin and GREENBERG, Josh, 2006. Supplementing the Panoptic Paradigm: Surveillance, Moral Governance, and CCTV. In: LYON David, Theorizing Surveillance: The Panopticon and Beyond, Cullompton. Willan Publishing, pp. 228-242. INSTITUT D’AMÉNAGEMENT ET D’URBANISME D’ÎLE-DE-FRANCE (IAU), 2008. Vidéosurveillance et espaces publics: État des lieux des évaluations menées en France et à l’étranger. Paris: IAU publications. LECLERCQ, Stéphane, 2009. Les caméras de vidéosurveillance : levier démagogique ou dispositif disciplinaire moderne ? De quelques considérations pratiques sur les conditions d’utilisation de la vidéosurveillance dans le secteur policier. In DEVRESSE Marie-Sophie and PIERET Julien (dir.) La vidéosurveillance. Entre usages politiques et pratiques policières. Brussels: Politeia, pp. 137-176. MONITEUR BELGE, 2007. Loi relative à l’installation et à l’utilisation de caméras de surveillance. Moniteur Belge. 31 March 2007. MONITEUR BELGE, 2013. Arrêté royal relatif aux plans stratégiques de sécurité et de prévention et aux dispositifs Gardiens de la Paix. Moniteur Belge. 7 November 2013. MORTELÉ Jill and DEPRINS Famke, 2012. La vidéosurveillance dans l’espace public est-elle vraiment efficace ? Une analyse quantitative. Brussels. SPF Intérieur. NEOCLEOUS, Mark, 2000. The Fabrication of Social Order: A Critical Theory of Police Power. London: Pluto Press. NEWMAN ,Oscar, 1972. Defensible Space: People and Design in the Violent City. London: Architectural Press. NIMY, Yolande, 2014. 29 nouvelles caméras de surveillance. In: 7 Dimanche. 12 October 2014. NORRIS, Clive, 2009. A Review of the Increased Use of CCTV and Video-Surveillance for Crime Prevention Purposes in Europe. Brussels. DG IPOL. REA, Andrea, 2007. Les ambivalences de l’État social-sécuritaire. In: Lien social et Politiques, No. 57, 2007, pp. 15-34. RUIZ CHASCO, Santiago, 2014. Videovigilancia en el centro de Madrid: ¿Hacia el panóptico electrónico? Revista Teknokultura, vol. 11, No. 2, pp. 301-327. SIMONET, Marie-Dominique, 2013. Circulaire n°4487 “Prévention à l’égard de la radicalisation des esprits pouvant mener à des actions violentes”. Fédération Wallonie-Bruxelles. 11 July 2013. 1 See Debailleul and De Keersmaecker [2014: Appendixes] for a detailed account of the interviews and methodology. 9 Unfortunately, this account of the political context disregards the opposition to CCTV, as it goes beyond the scope of our research. We nonetheless hope that this opposition will persist and that it will be explored in future.